Rumor has it that three Koreans are new to Chipman Elementary. I march out to the playground, eager to make them my friends. Now in the second grade, I have never had kids my age who look the way I do, speak the language of my family, and eat the stinky foods I love. I know what it feels like to be new to a school, especially one in another country. I want to be a friend to them just as Rachel, a Jewish girl, was to me in kindergarten when I could not speak any English. After a quick scan of the monkey bars, merry-go-round and seesaw, I find the Korean kids by the swings. Two boys and a girl. Even from afar, I see a bright pink dress on a girl with pigtails. As I make my way to them, I think about how to introduce myself. Ahn-nyoung? Or a more formal ahn-nyoung-ha-se-yo, since I have never met them before? I’m sure hello will do. They can understand that much, right? Drawing closer, I realize that the scene I had imagined of the kids—laughing and gliding through the air on the swings—is not exactly what I find. They seem more like a gang that is off to themselves, sitting still on the swings and kicking the sand at their feet. 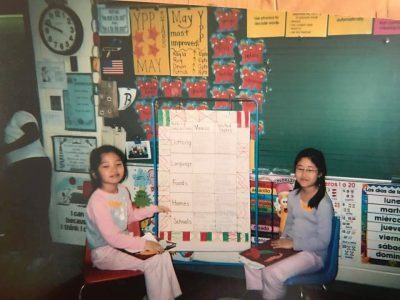 YeJin (left) and me in second grade, presenting a class project about Mexico. Her name is YeJin. She speaks with a tone an octave lower than what I expected from a second grader with pigtails. She also uses a dialect of Korean I had never heard before. It’s the type of dialect a gruff man with farmer’s hands would use. YeJin’s cool aura first intimidates me, yet we quickly become good friends. Perhaps we both had been in search of a Korean girlfriend in a country that was obviously not our own. As her friend, I firmly believed that my role was to help her learn English—fast. It was all for her good so that she could enjoy life in America. It seemed the teacher was my ally on this mission. She asked me to direct-translate the lessons for YeJin and the two boys. Every day, when it was time for the lesson, the teacher gave me a nod, which was the cue for all the Korean kids to meet at a table in the back of the classroom. I was the teacher. YeJin and the boys were my students. The precocious child that I was, I sat up straight and folded my hands together on the table, rolling back my shoulders, ready for the day’s lesson. For the rest of the year, the class went on like this. What bothered me, though, was that YeJin insisted on speaking Korean outside the classroom. While I tried so hard inside the classroom to teach YeJin how to say the names of animals or the details of a storybook, she did not use any of those English words in our conversations as friends. I thought that she was never going to learn if she didn’t apply her knowledge of English in real-life situations. I was met with resistance. Once, my classmates and I were walking in a line to the cafeteria when YeJin tapped me on the shoulder from behind. She asked me in a whisper if I knew how to say the word pink in Korean. When YeJin spoke in Korean, I found again the cool, confident girl I met for the first time on the playground. It was the first time she taught me something.